Township Hall Rental. Call for times, fees and availability. 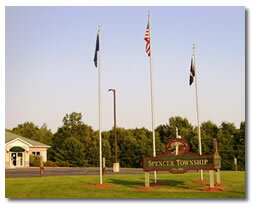 Spencer Township Hours. Tues & Thurs 8:30 am - 12:30 pm and 2:00 pm - 5:00 pm. Wednesday 8:30 am - 12:00 pm. Closed Monday and Friday. Burn Permits. Please email spencerburnpermits@gmail.com for burn permits.